A little-known federal program has billions to dole out for renewables and efficiency projects for underserved populations. From the best-kept secrets file: There is a little-known $6.25 billion federal fund offering low interest loans and guarantees to utilities looking to build rate-based infrastructure. It gets better: Along with the funding, utilities can work cost-free with knowledgeable staff anxious to get applicants successfully through the process of building the kinds of renewable energy, smart grid, and efficiency projects utility customers are clamoring for . . . There is a catch: While the funding opportunity is available to all types of power providers, the projects have to meet the needs of underserved communities with populations of 20,000 or less. Read more. 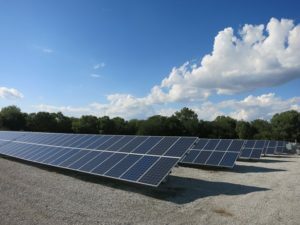 This entry was posted in Nebraska / Midwest News, NewsBlog and tagged Herman K. Trabish, Nebraskans for Solar, renewable energy development in rural communities, Rural Electric Cooperatives, Rural Utilities Service (RUS), US Department of Agriculture (USDA), Utility Dive on June 10, 2016 by Helen Deffenbacher.